On October 24, most of the people who come to Cornbread Supper sometimes came all at the same time, along with interested—and most welcome—newcomers. Sometimes that happens: groaning table, lots of talk and laughing and slamming of doors and conviviality. Sometimes the table has bare spots, and people can sit and eat in two seating areas, max. The meal may not be exactly balanced, but there is enough. More talking, laughing, conviviality. 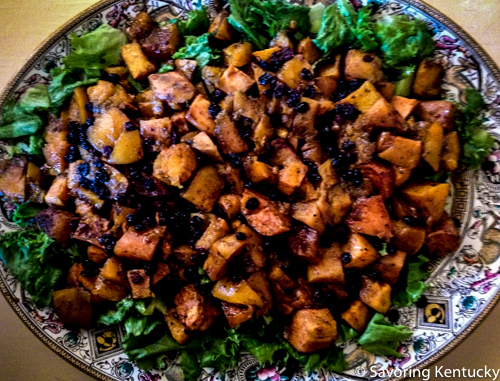 It's Sue McKaig's "Sweet Potatoes & Squash w/Honey, Cinnamon, S&P, Olive Oil with Currants splashed with Ouita's Bourbon-Sorghum Dressing"
All foods and drinks always welcome. The Solar System Is Chocolate! Of Course It Is!